(Paris, France) — The Professional Coin Grading Service (www.PCGS.com) has opened an office in Paris, France as part of the company’s expanding international services. The new facility, physically establishing PCGS’s third-party grading in Europe, already is being praised by several of the European Union’s top numismatists for the convenience it brings to collectors and dealers in EU countries. "The opening of a PCGS grading center in France is very good news for all European dealers and collectors who can now have their coins graded more easily. The time-consuming and costly exportation of sending them first to the United States, along with customs issues, will soon only be bad memories!" said Eric Palombo of Maison Palombo in Marseilles, France. "For several years we’ve been successfully increasing our presence in Europe and Asia with participation at major numismatic events and agreements with government mints," said Don Willis, President of PCGS, a division of Collectors Universe, Inc. (NASDAQ: CLCT). "The establishment of a full-time office in a major European capital now gives us an even greater opportunity to conveniently and efficiently assist EU collectors and dealers with the certification of their coins." To expedite services and eliminate the need to send coins to the United States, effective June 1, 2010, all submissions to PCGS from EU countries for grading, re-grading or crossover service will be made through the Paris office. "Grading will be performed on-site on a regular basis. All submissions from the EU to the Paris office must be made through a PCGS Authorized Dealer located in the EU. Submissions are accepted from those dealers by appointment only," explained Muriel Eymery, Manager of the Paris office and PCGS Director of International Business Development. Three other prominent dealers also praised the establishment of the Paris office. Fabrice Walther of Numisaisne Paris stated: "We thank PCGS very much for establishing a presence in Europe, especially in Paris. We are convinced that in the very near future PCGS grading will make the European and world coin markets more dynamic than anybody today could have foreseen." Arnaud Fhal of Godot Et Fils in Paris commented: "With PCGS in Paris, French and European coin collectors can finally have easy and secure access to impartial, independent grading and the capacity to know and get the best prices for their coins." "Bienvenue to PCGS graded coins! The PCGS European setting is most welcomed in Paris. 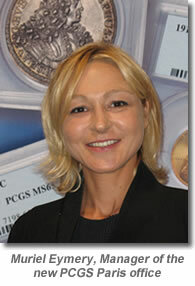 PCGS will further strengthen collectors’ confidence and security and add value to their coins." For a list of PCGS Authorized Dealers in the EU, visit www.PCGS.com/dealers and click on the map to locate your country. Submissions from countries outside the EU must continue to be made to PCGS headquarters in California. Since 1986, PCGS experts have authenticated, graded and certified over 19 million coins from around the world with a total declared value of nearly 20 billion USD. Additional information is available in English and other languages online at www.PCGSglobal.com. To arrange for submissions to the PCGS Paris office, contact Muriel Eymery by phone at 33 (0) 1 40 20 09 94 or by email at info@PCGSglobal.com. HI PCGS friends, I have a some of Asia and the British coin to send your company’s for grading. But I do not know how to do. I have no experience, because the coin rating services in the European part of the new transaction. Can teach me how to enjoy your company services? Thank you! ! I live in the UK. .I am not a member of your company. Thank you very much.!! !